Concur Increased Pipeline Contribution by Over 50%! Concur, part of SAP, is a leading provider of integrated travel and expense management solutions, which help organizations ensure corporate travel is booked within policy before the trip is taken and reconciles expenses after travel is complete. Concur needed to improve efficiency and productivity, enabling them to execute more events with less hands-on intervention required. Concur partnered with DemandGen to implement the much needed integration. 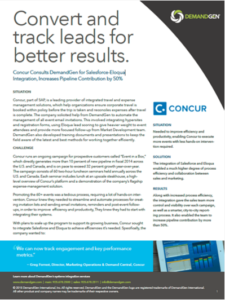 To ensure Concur was addressing the strongest possible leads first, the team automated the management of all event email invitations, and integrated hypersites and registration forms through Eloqua using advanced integration between Salesforce and Eloqua’s Event Module. The integration of Salesforce and Eloqua enabled a much higher degree of process efficiency and collaboration between sales and marketing. Along with increased process efficiency, the integration gave the sales team more control and visibility over each campaign, as well as a smarter, city-to-city reporting process. It also enabled the team to increase pipeline contribution by more than 50%. The biggest benefit Concur has seen from implementing DemandGen’s solution is that everyone—from their sales reps to their channel reps to their marketing operational teams—is on the same page, and have a clear view of their shared goals and activities. This shared vision enables Concur to collaborate effectively to make their events even more successful.